Last Call with Carson Daly is an American late night television program hosted by Carson Daly and broadcast on NBC. Formerly a traditional talk show, the half-hour program consists of several produced segments, featuring interviews with musicians, comedians, actors, filmmakers, and other artists, along with pre-taped on-location musical performances. It debuted in 2002. Unlike other programs in NBC's late night line-up, Last Call typically records only 24 weeks of original shows a year with the rest of the year being taken up by reruns. Last Call premiered in 2002 as the successor to Later. Last Call initially aired Monday through Thursday until the cancellation of Late Friday in late May 2002, it has been aired five nights a week since. Its premiere was delayed one day at the last minute due to a contract dispute. Last Call was originally taped in Studio 8H of the GE Building in New York City, which was also the home studio of Saturday Night Live. However, this required the producers to work around the schedule of Saturday Night Live. During this phase, Last Call had no house band and no jokes or monologue, going straight to the first guest at the beginning of the show. The stage was set up in an empty black box theater style, save for two low-slung chairs and a small table. Each week, a different unsigned band was brought in to do the music, in addition to any musical act at the end. Gradually, the set acquired more furnishings and decor, much of which was influenced by the occasional week-long trips to Las Vegas. In 2003 and 2004, Last Call was nominated for a Teen Choice Award for "Choice TV Show – Late Night". Last Call was originally planned to broadcast in high-definition when Studio 8H was retrofitted for Saturday Night Live; however, instead, the show was relocated to Los Angeles in September 2005, and continued to air in standard-definition. After the move, Last Call began to resemble its counterparts, with a more traditional set, permanent house band led by Joe Firstman, short monologue and occasional comedy bits. In November 2005 Joe Firstman became the official house band leader for Last Call. Notable members of his band include Kamasi Washington, Thundercat (musician), Kenny Aronoff, Mike Miley (Rival Sons), Brian Wright (musician), Zane Musa, Zane Carney, Mark Bryan, Marc Ford, and Ryan Porter. Firstman wrote the majority of the material the band performed. Production of new Last Call episodes was suspended for a month due to the Writers Guild of America strike, but on December 4, 2007, Last Call became the first late night talk show to resume production during the strike. On air, Daly explained that the only reason the show resumed production was that he was given the option to either return or have the show's 75 non-striking staff members fired. The shows were not scripted and did not include monologues. The Writers Guild of America (WGA) was critical of Daly, accusing him of crossing picket lines and labeling him a scab. Daly is not a member of the WGA. On November 27, 2007, he was accused by the WGA of soliciting jokes for his show through a telephone hotline. On December 11, 2007, an organized group of WGA writers attended a taping of Last Call. First, one heckled during an interview with Jerry Rice. After security removed the first writer, another spoke up disruptively, expressing sympathy with striking writers. A producer asked anyone planning to disrupt the show to leave or face prosecution; between five and twenty left. As the end of Late Night with Conan O'Brien was approaching, Daly made it public that he was interested in moving to the Late Night time slot. Jimmy Fallon was chosen to replace O'Brien, a choice that executive producer Lorne Michaels had in mind dating back to the day that Fallon left Saturday Night Live in 2004. "Currently in its eighth season, NBC's Last Call with Carson Daly utilizes a new style by introducing a documentary style format. 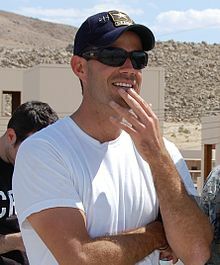 Host Carson Daly gets out of the studio and takes the show on location each night. Recent highlights include Daly’s motorcycle trip across the historic Route 66, a visit to comedian Tom Green's house in the Hollywood Hills, and a scene at the Whiskey Bar with the Grammy Award-winning band Kings of Leon." With the change, the usual late-night talk show trappings of a house band, studio audience, and comedy were abandoned. In May, NBC announced that Last Call had been renewed for a ninth season, which debuted on September 21, 2009. On January 8, 2010, it was reported by multiple media outlets that The Jay Leno Show was moving to 11:35 p.m., the Conan O'Brien-hosted Tonight Show to 12:05 a.m., and Late Night with Jimmy Fallon to 1:05, which would have resulted in Last Call losing its time slot (as NBC did not include plans to move Poker After Dark, at the time the show which followed Last Call in some markets, to a later slot). NBC confirmed the move, along with the possible end of Last Call. NBC had repeatedly emphasized that its focus is retaining the lineup of Leno, Tonight and Fallon. NBC chairman Jeff Gaspin told ABC News he expected Daly to stay with the network "in some fashion", but did not elaborate. On January 9, after the lineup changes were first rumored in the press, Daly made an unannounced stop on Jimmy Kimmel Live!, appearing from the crowd during an audience Q&A session with Kimmel. Daly jokingly asked, "What will happen to my show?" Referencing the contestant elimination process on the show Survivor, Kimmel responded, "As long as you have your immunity idol, I think you're safe." Daly then asked, "Can I have your show?" Kimmel responded, "No." After O'Brien was effectively forced to leave NBC and Leno was subsequently re-installed as host of The Tonight Show, Daly remained at his spot and received a 4% surge in ratings. In the May sweeps, Last Call received a 5% increase in viewership compared to the previous year. In the same month, next day encores of the series began to air as part of Fuse's early primetime schedule. Despite the program being produced in a 16:9 frame since at least 2008, Last Call was still presented in a 4:3 letterbox mode until September 19, 2011, when it became the last program (outside of the network's outside-controlled Saturday morning Qubo block) on NBC's schedule to make the full conversion to high definition broadcast. This also made it the last of the major late night talk programs on broadcast and cable to make the switch. On April 3, 2013, NBC officially announced that Jimmy Fallon would succeed Jay Leno as the host of The Tonight Show following the 2014 Winter Olympics. Daly was again passed over for host of Late Night when Seth Meyers was announced as Fallon's successor on May 12, 2013. In September 2013, NBC announced that Daly would be moving to The Today Show and leaving Last Call; it was not revealed if the program would continue without him. It was eventually decided that Daly would limit his role on Last Call to the opening and closing segments as of the 13th season. All other segments are either interviews done by producers or production assistants without comment by them, or straight musical performances with only Daly's continuity introducing them. Last Call was originally to resume production for its thirteenth season in April 2013 but this was delayed and production did not begin until fall. The thirteenth season premiered in late October 2013. The show's future was uncertain, with speculation that the show may continue with another host, format, or end entirely and an initial announcement by NBC in September 2013 that Daly was leaving Last Call entirely in order to take up his new role on the Today Show. A full season of 24 original week's worth of episodes was announced, however, with Daly as host but he now only tapes opening and closing segments; interviews are now conducted by the show's producers with only the interviewee appearing on camera. Though there was originally talk of expanding Fallon's Tonight Show to 90-minutes which would have bumped Last Call to 2 am or possibly have resulted in its cancellation, the change of late night time slots did not come to pass and the show's start time remained unchanged. The show began airing its new episodes January 30, 2014, with a hiatus during the 2014 Winter Olympics. New episodes resumed on February 24, following the premiere of Late Night with Seth Meyers. Currently the show is in its seventeenth season, and is currently the longest-lived late night weeknight show on American television with the same host, behind the 1991-premiered Charlie Rose on PBS. ^ Last Call with Carson Daly at epguides. ^ "Daily News America – Breaking national news, video, and photos – Homepage – NY Daily News". Articles.nydailynews.com. Retrieved 2013-09-16. ^ a b "Carson Daly sticking with Last Call for now as NBC mulls a reboot". TV Guide. Retrieved December 18, 2013. ^ "DALY'S 'CALL' IS A NO-SHOW". ^ "Saxophonist Kamasi Washington, fresh from Kendrick Lamar's To Pimp a Butterfly, steps into the limelight". Retrieved 2015-10-05. ^ "Carson Daly to defy writers strike". MSNBC. November 27, 2007. Retrieved December 30, 2007. ^ a b Finke, Nikki (November 27, 2007). "WGA Scolds Carson Daly For Returning 'To Support Staff' And Seeking Scab Jokes". Deadline Hollywood Daily. Retrieved December 14, 2007. ^ "Carson Daly Seeking Scabs". The Smoking Gun. November 27, 2007. Retrieved 2007-12-14. ^ Finke, Nikki (December 13, 2007). "Carson Daly's Taping Disrupted by Writers". Deadline Hollywood Daily. Retrieved December 14, 2007. ^ Farhi, Paul (March 1, 2009). "Ready or Not, Here Comes Jimmy Fallon To Update Late Night". The Washington Post. Retrieved April 15, 2009. ^ "Last Call with Carson Daly". NBC. Retrieved 2009-04-15. ^ "NBC Picks Up 'Last Call With Carson Daly'". Broadcasting and Cable. May 14, 2009. Retrieved 2009-09-24. ^ Daly, Sean (January 16, 2010). "Just call him Conan O'Flyin'". New York Post. ^ "Entertainment News, Celebrity Interviews and Pop Culture – ABC News". Abcnews.go.com. Retrieved March 23, 2012. ^ Robertson, Lindsay. "Carson Daly Shows Up on Jimmy Kimmel's Show to Joke About Jay-Conan Stuff – Vulture". Nymag.com. Retrieved 2012-03-23. ^ Levine, Stuart (August 19, 2010). "EXCLUSIVE: NBC Renews "Last Call" for 10th season". Variety.com. Retrieved August 22, 2010. ^ JAY LENO AND JIMMY FALLON FINISH #1 VS. ABC AND CBS COMPETITION IN THE MAY 2011 SWEEP NBCUniversal. June 3, 2011. Retrieved on June 4, 2011. ^ Leora, Arnowitz. "Jay Leno leaving 'The Tonight Show,' Jimmy Fallon taking over in 2014". Fox News Channel. Retrieved April 3, 2013. ^ Andreeva, Nellie (May 12, 2013). "Seth Meyers Named Host Of NBC's 'Late Night', Lorne Michaels To Executive Produce". Deadline.com. Retrieved May 12, 2013. ^ O'Neal, Sean (September 12, 2013). "NBC to Imprison Carson Daly Within an Orange Room Made of Tweets". The A.V. Club. ^ a b Andreeva, Nellie (November 22, 2013). "'Last Call With Carson Daly' Carries On With New Format". Deadline.com. Retrieved February 15, 2014. ^ "NBC prepping Jimmy Fallon for 'Tonight Show' takeover - EW.com".